After Finding Nemo, the trio goes back to the big blue ocean to move on with their lives, with nothing new aside from Dory’s (Ellen Degeneres) constant battle with her short term memory loss. Things change when she suddenly gets flashbacks of her family, making her wonder where they have been all this time and whether they are still looking for her. With bits and pieces of vital information coming back to her one by one, she starts to put the pieces of the puzzle together and asks Marlin (Albert Brooks) to help her find her mom and dad. 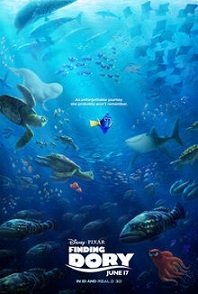 He is hesitant to take on another big adventure after what just happened to them, but Nemo (Hayden Rolence) convinces him otherwise, telling him that Dory has not just been instrumental in their reunion, but is also considered as a part of their family. And so begins yet another fish out of the water adventure guaranteed to make you laugh, and maybe cry a little bit. The problem with Finding Dory is that the storyline is recycled, with roles just being switched in order to say that it is something totally new. But this is not really a bad thing. Pixar did wait for more than a decade to come up with a sequel to Finding Nemo, and this gap is probably the most important part of the equation. Remember when Toy Story 3 came out years after the sequel? The concept was a runaway victory from the very beginning because Pixar managed to squeeze in a special variable in there, that of the audience growing up with the franchise so that those who saw the first two films as kids were already adults when the third one came out. The effect was overwhelmingly emotional because it marked the end of an era for many of them. They tweaked that formula a bit and simplified it here, which is perhaps why it sort of weakened the intended impact. While Toy Story took advantage of the gap between the last two films and incorporated it in the story for dramatic effect, here, only a year has passed since the events in the first movie took place. It doesn’t hurt that it’s been 13 years and that these characters are endearing enough for you to sit back and watch them redo everything. This could have been akin to a Disney sequel that goes straight to home video, but Pixar knew how to wait, and now they are reaping the benefits of the box office juggernaut that this sequel has become. Perhaps everything works because Pixar knew well to emphasize the importance of family as a theme. While we’ve already witnessed the eventual reunification of Marlin and Nemo, Dory’s quest to find her parents is really something more of a bigger deal, given how she lost them (or they lost her) back when she was really young. As such, their reunion is nothing short of poignant, a tour de force that will make you shed a tear and reevaluate the very relationship you share with your very own folks. But this does not mean that the film is perfect. Even for a premise which is just so out there in terms of the suspension of disbelief involved, this one almost goes overboard by presenting scenarios that are so contrived it leaves you scratching your head. There is this seven-legged octopus called Hank (Ed O’Neill) who is as funny as he is demented, but watching him drive a truck without seeing the road and successfully escape is just plain bizarre. Wait, the mere fact that he is driving at all is already a bit of a stretch. This is not the only scene that makes you feel this way. In the end, you still appreciate the end product overall, for old time’s sake, but you just can’t help but feel that the writers made it too convenient for themselves this time around. Despite its drawbacks in terms of plot development, Finding Dory is still a masterpiece as far as animation is concerned. It reminds us that animated films are not just for children anymore like they used to be. They can also now be used as reliable avenues to tell stories about themes that are close to our hearts, in a creative manner that can provoke our imagination like live action can never do.